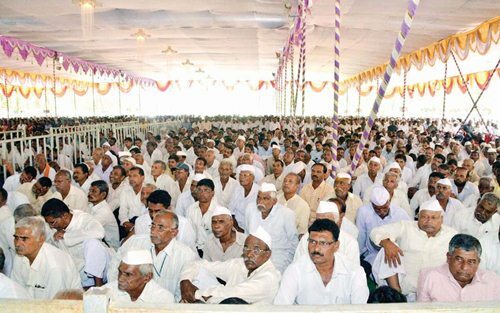 On July 15, 2016, thousands of people from all walks of life gathered at the Hutatma Kisan Ahir Sugar Factory at Walva in Sangli district to commemorate the 95th birth anniversary of the renowned freedom fighter and one of the progressive stalwarts of the co-operative movement in Maharashtra, Nagnath Naikwadi. Naikwadi was one of the leading lights of the Satara Parallel Government against British rule that was led by ‘Krantisimha’ Nana Patil. The chief guest at the function was CPI(M) general secretary Sitaram Yechury; it was chaired by Ganpatrao Deshmukh, the senior most legislator in the Maharashtra state assembly and respected leader of the Peasants and Workers Party (PWP); other speakers were senior secular journalist Kumar Ketkar and CPI(M) central secretariat member Dr Ashok Dhawale; and the introductory remarks were made by Vaibhav Naikwadi, the chief organiser of the function and chairman of the Hutatma (Martyr) Kisan Ahir Sugar Factory. The Satara Parallel Government in Maharashtra from August 1943 to May 1946 against British rule was a legendary chapter in the glorious freedom struggle of India. It was an armed offshoot of the 1942 Quit India movement, like the parallel governments in Midnapore in Bengal, Bhagalpur in Bihar, Ballia in Uttar Pradesh and Basudevpur in Odisha. The leader of the Satara Parallel Government was ‘Kratisimha’ Nana Patil (1900-1976), who later joined the Communist Party and was elected to the Lok Sabha on the CPI ticket from Satara in 1957 and again from Beed in 1967. Nana Patil was also elected national president of the All India Kisan Sabha (AIKS) at its 13th conference at Dahanu in Thane district in May 1955. He was one of the towering leaders of the Samyukta Maharashtra Movement. British rule was effectively overthrown in large parts of Satara district (now bifurcated into Satara and Sangli districts) of Western Maharashtra during those three years. The Parallel Government (Prati Sarkar) movement was a guerrilla type of struggle, and it operated in over 150 villages with solid peasant support. There were raids on Taluka Treasuries and Armouries. The Prati Sarkar took over many of the functions of the Government. This Parallel Government established many public utilities like a market system, supply and distribution of food-grains and a judicial system to settle disputes and penalise dacoits and robbers, pawnbrokers and money lenders. Law and order was entirely in its hands. Under this government an army was formed named Toofan Sena. It harassed the imperial government by attacking its major establishments like the railways and postal department. Nana Patil was influenced by Mahatma Phule’s Satyashodhak ideology and Rajarshi Shahu Maharaj’s work for social justice. He worked towards social reform through various means like establishing the frugal style of marriage ceremonies, propagation of education, establishing libraries, eradicating superstitions, de-addiction of the rural populace, etc. Some of Nana Patil’s closest comrades-in-arms in the Satara Prati Sarkar were Nagnath Naikwadi (Anna), G D Lad (Bapu), Nathaji Lad and Kisan Ahir (who was martyred). Nagnath Naikwadi (Anna) was born on July 15, 1922 in a farmer's family in Walva. At a young age, he joined the Quit India movement and came in contact with Nana Patil. During the early 1940s, he and his colleagues resorted to armed actions against British rule. In order to raise funds for and to defend the Prati Sarkar, Anna was part of a revolutionary group that looted a special train in Shenoli, District Satara on June 7, 1943, rifles from a police station in Sangaon, District Kolhapur on October 10, 1943, and conducted a daring raid on a treasury in Dhule on April 14, 1944. In one of the battles with the British police, he was injured by a bullet and was caught after which he was sent to Satara jail, from where he escaped by staging a jailbreak, along with his fellow activists. The British government announced a big reward on his head, but Naikwadi managed to stay underground for four years. He also later supported the insurgency against the Nizam of Hyderabad. After Indian independence in 1947, Naikwadi never joined the Congress. He shifted his focus to social work. He founded a large number of model educational institutions for the poor and underprivileged. In the 1950s he was active in the Samyukta Maharashtra movement and in 1957, he won the state assembly elections and served as an MLA till 1962. The next two decades of his life were associated with the cooperative movement and sugarcane farming, starting with the implementation of Kisan Lift Irrigation Scheme in 1972 and culminating in the establishment of Hutatma Kisan Ahir Cooperative Sugar Factory in 1984. It is one of the most progressive and best-run sugar factories in the country for the last three decades. Last year it gave farmers a record Rs 2,715 per tonne for cane; 40 per cent bonus to sugar factory workers; and permanent houses to sugarcane cutters. Naikwadi helped in the Latur Earthquake relief activities and in the establishment of a Water Conference for the drought affected areas. The Government of India awarded him the civilian honour of the Padma Bhushan in 2009. He died on March 22, 2012, at the age of 89. After paying floral tributes to the statues of ‘Kratisimha’ Nana Patil who breathed his last in Walva, and of Nagnath Naikwadi, the huge public meeting began. Vaibhav Naikwadi in his introductory remarks, recalled the glorious legacy of the freedom struggle and spoke of the series of progressive steps being taken in the Walva area to improve the lives of the people. Sitaram Yechury hailed the valiant anti-imperialist struggles waged by Nana Patil, Nagnath Naikwadi and their comrades and lauded the progressive cooperative and educational work being carried out in Walva over the last several decades. He said that Walva was a place of pilgrimage for revolutionaries and the constructive developmental work done here will serve as an example to the country that needs to be emulated. Yechury said that the dream of indomitable freedom fighters like Nana Patil and Nagnath Naikwadi to create a happy and equitable India, however, lies in tatters today. Exploitation, poverty, malnutrition and peasant suicides are the order of the day. In spite of our country being rich in resources, agriculture, irrigation, industry, employment and education are in doldrums. This is the result of the pro-capitalist and neo-liberal policies followed by the ruling classes for the last several decades. Coming down heavily upon the BJP-led central government, he said that while thousands of farmers are forced to commit suicide due to indebtedness of a few thousand rupees, big corporates are refusing to pay back bank loans worth Rs 8.5 lakh crore rupees. Not only is no action taken against them, they are being given further tax concessions to the tune of Rs 5.8 lakh crore every year by this government. This one fact alone makes it crystal clear whose side this government is on. On the other hand, said Yechury, every effort is being made by the Modi regime to divide society on the lines of religion and caste and to target dalits, adivasis, minorities and women – the most socially oppressed sections of our society. The communal polarisation of society is sought to be done for selfish political gains. It is time to take forward the legacy and the struggle of our freedom fighters and to fight against neo-liberal policies and also against communalism and casteism of all hues. He concluded by saying that it is the responsibility of all of us to build a democratic, secular and equitable India of our dreams. Kumar Ketkar said that the cooperative movement for which Naikwadi fought, is now being dismantled and is being replaced by privatisation. The economy of the country is in crisis but false ideals are being placed before the people. Attempts of the RSS-BJP to foist a Hindu Rashtra are dangerous and must be repulsed. Making a comparison between Abraham Lincoln and Mahatma Phule who were contemporaries, he said that the egalitarian ideals of both were similar. But if the present harmful trends grow, the forces of reaction will try to wipe out words like secularism and socialism from our country. That is why all attempts must be made to unite the people to resist these dark forces tooth and nail. Dr Ashok Dhawale said that Nana Patil and Nagnath Naikwadi throughout their lives epitomised the struggle against imperialism, for socio-economic justice and for secularism. The ruling classes are bent on reversing these ideals. This is seen in their callous attitude to the grim drought and flood situation, the alarming rise in peasant suicides and malnutrition-related deaths of children, the increasing atrocities on dalits and women and the malevolent communal drive. It is for all of us to come together and wage a relentless battle to defend and advance the ideals for which innumerable freedom fighters laid down their lives. 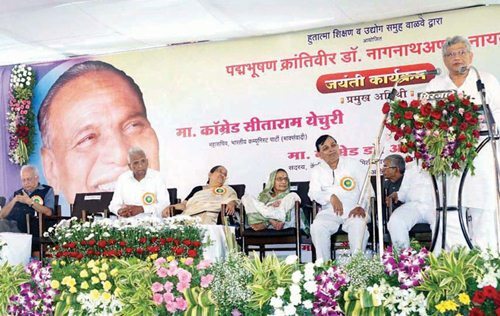 Ganpatrao Deshmukh in his presidential remarks, praised the valiant and multifarious work both before and after independence of stalwarts like Nana Patil and Nagnath Naikwadi and called upon the gathering to wage a united struggle to remain true to their ideals.